On a ledge marking the entrance to Stamford Harbor. The entrance to Stamford Harbor contains many treacherous reefs. 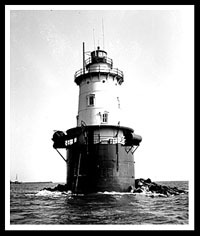 The Stamford Harbor lighthouse was built in 1882 to guide mariners into the harbor. In 1931, Keeper Bliven, who had been missing for three days, leaving the lighthouse unattended, was found dead nearby with his boat. Although some believed his boat simply overturned, many suspected due to the head injuries discovered that he had been pushed off the lighthouse. No one was ever charged. In 1939, Keeper Marty Sowle, who served from 1938 to 1953, rescued one of two men whose boat had sunk in an October storm. For his heroism, he received a Congressional Silver Medal. Stamford has a rich history you can enjoy at the South-End historic district and has beaches and parks to enjoy. There’s plenty of architecture to study in this 177-acre area from the late 1870s to 1930s. One of these parks, the Jackie Robinson Park, is named after baseball legend, Jackie Robinson, who lived in Stamford. If you enjoy biking and hiking, the 220-acre Mianus River Park is worth visiting. Being an affluent area, if you are driving to get a distant view of Stamford Harbor Light, there are some great opulent homes to see along lower Shippan and Ocean Drive routes. Take a walk through the Bartlett Arboretum and Gardens, a 91-acre preserve in North Stamford including several species of “champion” trees, the largest of their type in the area. You can enjoy cultural events and arts at the Stamford Museum and Nature Center. If you are driving to get a distant view of the lighthouse, there are some great opulent homes to see along lower Shippan and Ocean Drive routes. For those who want to go out sailing out of Stamford Harbor along Long Island Sound, climb aboard the 3-masted Schooner SoundWaters for afternoon and sunset sails. The SoundWaters Coastal Education Center provides a variety of educational hands-on marine exhibits, events, and activities. Park at the dead end to view the lighthouse from the tiny fishing beach and look to the left to get a distant view. Best views are from one of the boats passing by. The three-masted schooner passes by on some excursions from Brewer Yacht Haven Marina in Stamford. 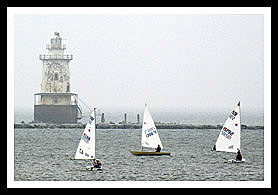 Depending on weather conditions, may occasionally pass Stamford Harbor Ledge Light, but does not offer a lighthouse cruise.